Each person’s vocation journey is unique. We encourage women who are discovering God’s call in their lives to participate in daily prayer, sacramental life, and service. The formation experiences we offer are a vital and helpful part of the discernment process. The Pre-Postulate program helps the woman decide if she has the desire and prerequisites to begin a formative journey with the Apostles. This initial period is called Pre-Postulate because it precedes formal application to the congregation. The Pre-Postulate will take place for two-weeks duration on the grounds of Mount Sacred Heart with other pre-postulants, other ASCJ sisters, and a sister-mentor. After the pre-postulate experience, a candidate may apply for acceptance into the Postulate program. The Postulate is the first official stage of formation prescribed by the congregation. Through the Postulate, the candidate continues to discern and verify the authenticity of her call to the Apostles’ particular charism. The Postulate takes place at Mount Sacred Heart and provides a deepening of the candidate’s spirituality, participation in works of the congregation, and service to the local church. The Postulate period lasts for two years. The Novitiate consists of a two-year period. The canonical year is dedicated to the religious and spiritual formation of the novice at Mount Sacred Heart. During the canonical year, the novice will experience the consecrated life through study and internalization of the evangelical counsels of poverty, chastity, and obedience. The apostolic year is a year of practical experience when the novice is assigned to an Apostle community to experience the many dimensions of religious life and share in that community’s life and ministry. The Novitiate period is a continuation of the journey towards holiness by means of a deeper experience of God. The Juniorate is the last stage of the Apostle’s initial formation. It is the period of temporary vows that the junior sister will renew annually until perpetual profession. During this time, the junior sister continues her spiritual formation, professional preparation, and apostolic experience. 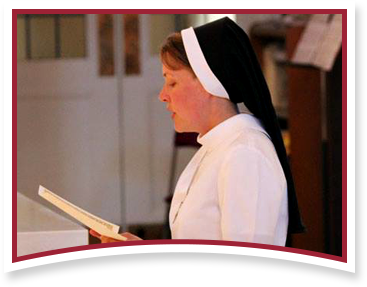 The temporarily professed sister spends two of the years in a formation community followed by living and ministering in a local apostolic community until the time of perpetual profession. This Juniorate time is a preparation for the total self-gift to God in the perpetual profession of vows as an Apostle of the Sacred Heart of Jesus, which takes place after five to nine years of temporary vows. Each Apostle of the Sacred Heart of Jesus continues on the formative journey every day of her life. This journey requires that the sister assume an attitude of constant discernment and self-evaluation, so that in all the circumstances of life she may assess the quality of her response to the Lord. The congregation regularly provides formative programs for the Apostles and encourages them to participate in other programs the local churches offer.